I got a little head start on the Kids Clothing Week Challenge this weekend. I worked on some knit tees from the Patterns by Figgy Tee for Two pattern. I actually made one for Will a little earlier and cut out the pieces for Jack's but never got around to it. This is why I'm loving the KCWC! A full week of clothes for my boys. They were excited to wear their matching shirts today. And excited that they were so soft. And had trucks and cars all over. 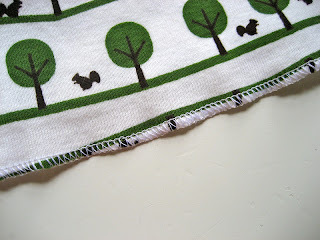 I also had some squirrel and tree fabric I though would be fun for fall. I made sure to order some brown knit last week to have it in time. Unfortunately, I ordered it online and it was not quite what I wanted. You should use a rib knit for the neck piece, but this was very thin and very stretchy. It kind of gathered when I sewed the raglan arm to the collar. Not quite boyish, so I'm not sure they will ever wear these. I have yet to try them on. As far as the pattern goes, I am very happy with the fit. I made the 2/3 for Will, who is 2 3/4, and the 4/5 for Jack, who is 4 1/2. It is a quick pattern and it includes a lot of tips for sewing with knit. I was very worried for the first one, but it was very easy with the stretch needle and the zig-zag stitch setting they recommended. 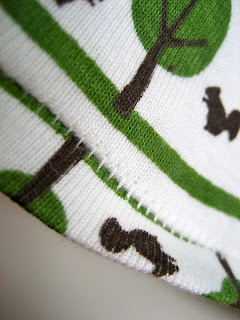 The tees in this pattern are supposed to be unfinished at the cuff and the hem, as knit will not fray like woven fabrics. This was the one part of the pattern I was not thrilled with, so when I cut out the pieces I added an extra inch to the sleeves and front and back of the shirt. 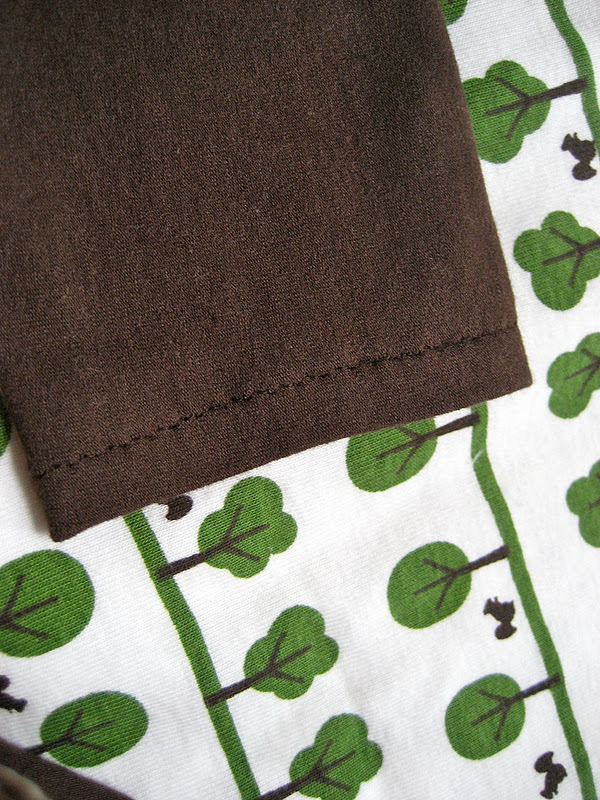 For the sleeve cuffs I just folded it in about an inch, pressed and sewed (using said zig zag stitch). The zig zag stitch has enough stretch to get them on and off easily. I do have a serger, but no experience sewing knits so I decided to experiment. For the hem above I just did a three thread overlock (sewing a few scraps first to get the differential for the feed dogs correct so as not to stretch it out and make a girly lettuce edge). 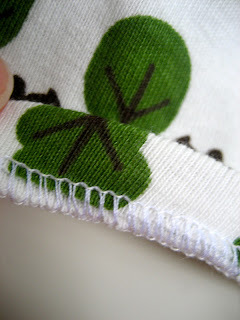 When I took the serger Mastery Class at my Bernina dealer I remembered them doing a blind hem type stitch where you fold the hem up and then back over to the front, sew all three layers and then unfold the hem. Despite playing around for a while, I didn't seem to get it quite right. I loosened the tension on the needle to be able to pull the hem open, but it wouldn't quite sit flat. I think I'm going to stop by the store and ask about it again. Unless any of you have a better way to finish a hem for a knit? I don't have a serger at home so I finish my knit hems using a double needle with wooly nylon in the bobbin. Works great and has a lot of stretch. btw, I found your blog from the KCWC flickr group. I've been looking around your blog and I love all the sewing you've done for your boys!